A long layoff became longer when Friday’s game against the United States National Under-18 team was cancelled due to a snow storm. The Terriers will take on the University of Maine for a third time this season, looking to take the season series. Check out Liam’s preview for The Daily Free Press. It was another successful draft weekend for the Boston University men’s hockey team, as five future Terriers were selected in the 2014 NHL Draft. BU and crosstown rival Boston College led all NCAA programs with five players taken in the draft apiece. ’96 forward Maxim Letunov was the first Terrier taken off the board, drafted in the second round (52nd overall) by the St. Louis Blues. Originally from Moscow, Letunov played for the Youngstown Phantoms of the United States Hockey League, finishing third on the team with 43 points (19 goals, 24 assists). Letunov will return to Youngstown for the 2014-15 season and is expected to join the Terriers the following year. Another BU recruit was selected just five picks later, as soon-to-be freshman defenseman John MacLeod was taken in the second round (57th overall) by the Tampa Bay Lightning. 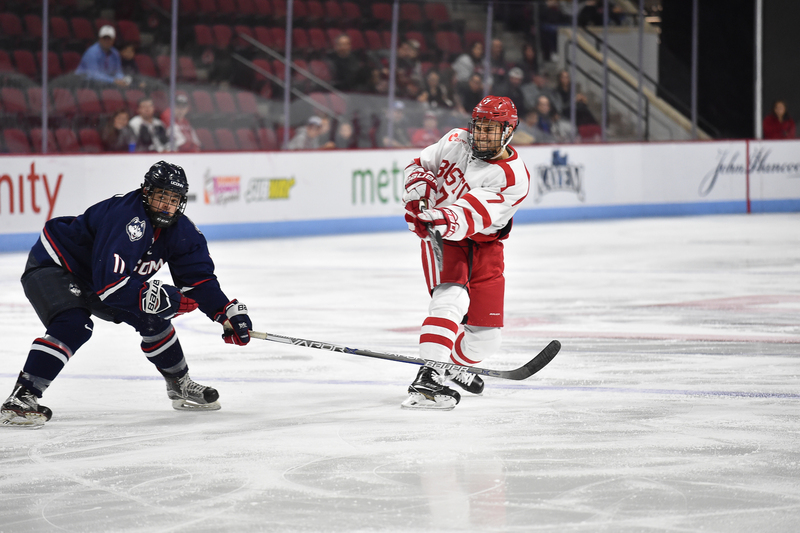 A native of Dracut, Mass., MacLeod played in 52 games with the U.S. National Team Development Program U18 team last season, recording five goals and six assists for a total of 11 points. MacLeod, who played alongside two other incoming BU freshmen — forward Jack Eichel and defenseman Brandon Fortunato — with the NTDP U18 squad, is expected to be a physical presence on the BU blueline next season. I am so honored to be apart of the @TBLightning organization! Thank you to all friends and family that helped me get to this point!! In the third round of the draft, incoming freshman defenseman Brandon Hickey was selected by the Calgary Flames (64th overall). Described by BU head coach David Quinn as a “fantastic skater” in a similar vein to captain and junior defenseman Matt Grzelcyk, Hickey played with the Spruce Grove Saints of the Alberta Junior Hockey League last season, contributing four goals and 18 assists (22 points) in 49 games. The Leduc, Alberta, native was the first AJHL player to be taken in the draft. Another member of BU’s 2014-15 freshman class was taken in the fourth round, as forward J.J. Piccinich was taken with the 103rd pick by the Toronto Maple Leafs. The Paramus, N.J., product played for the Youngstown Phantoms last season alongside Letunov, finishing second on the team in scoring with 27 goals and 31 assists (58 points). The 5-foot-11 forward projects as a strong skater with great offensive instincts. I can’t describe the feeling of being drafted by the @MapleLeafs organization. Thank you to all friends and family for making it possible!!! The final future Terrier chosen in the draft was 2014 forward Liam Coughlin, who was taken by the Edmonton Oilers in the fifth round (130th overall). A 6-foot-3 South Boston native, Coughlin recorded 51 points (27 goals, 24 assists) as a senior at Catholic Memorial in 2012-13 before totaling 45 points (18 goals, 27 assists) in 53 games with the Vernon Vipers of the British Columbia Hockey League last season. Sixty-two current and future NCAA players were chosen during the two-day event, marking the 13th consecutive year in which more than 60 college hockey players were selected in the NHL Draft. Former NCAA players made up 31 percent of NHL rosters during the 2013-14 season, an all-time high.